This track comes from a game that's relatively obscure in the West, no thanks to it being so old nowadays and the fact it's made by a Japanese company called KOEI. However, KOEI is one of the giants of Japan's gaming industry and the only company I personally recognise when it comes to PC game developers from that particular country (so it must be reasonably famous if I've even heard of them). 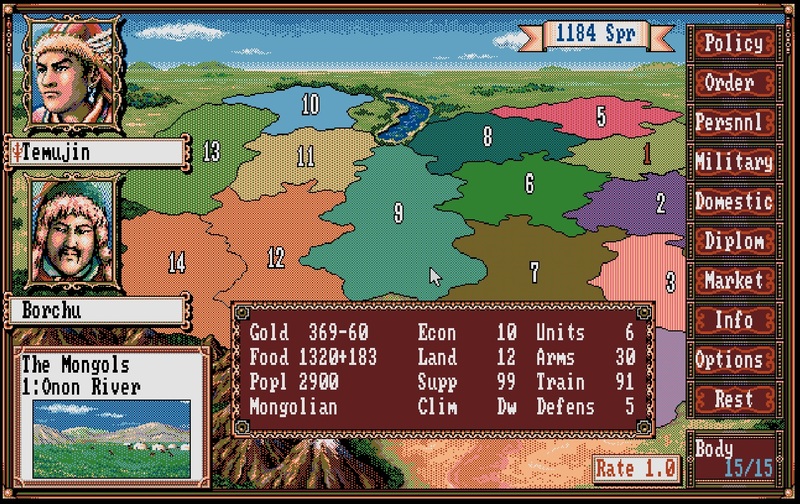 Regardless of how well KOEI is know in the West, I somehow managed to play a copy of the game, many years ago on the boarding house computer. Along with games like Scorched Earth and Llamatron, it quickly became a favourite. This track plays in the background when you're viewing the strategic layer for the Mongolian steppes. I'm not quite sure if the track is called "Mongolian Strategy" but it's a name I spotted on a website and it seems to fit. I'm also not entirely sure if Michiru Ōshima is the composer of the DOS soundtrack but I do know she was apparently uncredited for the NES version of the soundtrack, plus she has a pretty distinguished career as a composer, so it's most likely she composed the DOS version of the soundtrack too.